Pound cake Mrs. Hodges. 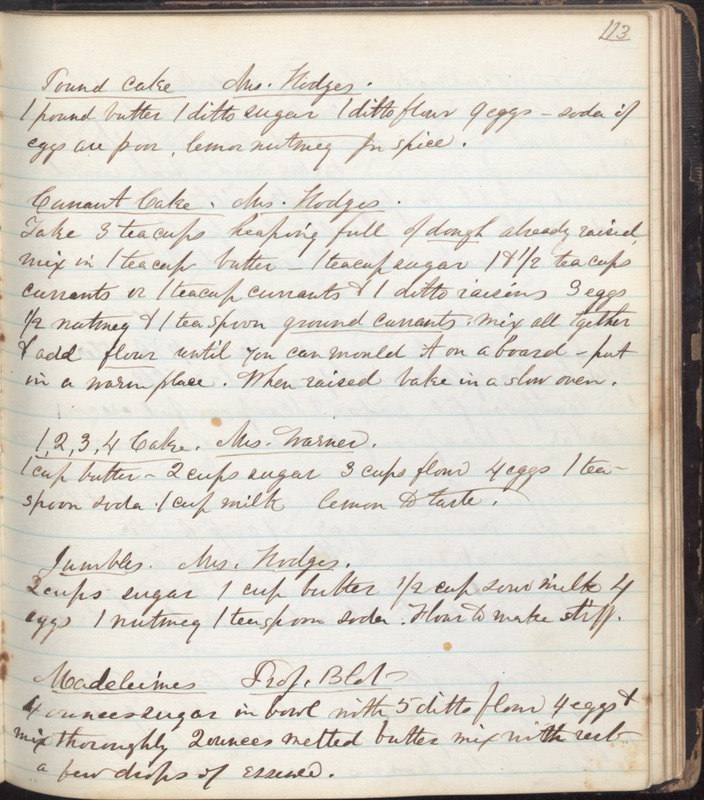 1 pound butter 1 ditto sugar 1 ditto flour 9 eggs -- soda if eggs are poor, lemon nutmeg for spice. Currant Cake. Mrs. Hodges. Take 3 teacups heaping full of dough already raised mix in 1 teacup butter -- 1 teacup sugar 1&1/2 teacups currants or 1 teacup currants & 1 ditto raisins 3 eggs 1/2 nutmeg & 1 teaspoon ground currants. Mix all together & add flour until you can mould it on a board -- put in a warm place. When raised bake in a slow oven. 1,2,3,4 Cake. Mrs. Warner. 1 cup butter -- 2 cups sugar 3 cups flour 4 eggs 1 teaspoon soda 1 cup milk lemon to taste. Jumbles. Mrs. Hodges. 2 cups sugar 1 cup butter 1/2 cup sour milk 4 eggs 1 nutmeg 1 teaspoon soda. Flour to make stiff. Madeleines Prof. Blot 4 ounces sugar in bowl with 5 ditto flour 4 eggs & mix thoroughly 2 ounces melted butter mix with rub a few drops of essence.